As the technology of 3D printing improves, it has the potential to revolutionize the practice of orthopaedic surgery. An institution’s investment in this technology, the authors say, can allow its surgeons to preoperatively plan complex cases, develop implant designs, and enhance education of residents and fellows. Three-dimensional (3D) printing technology has recently been introduced in medicine, with promising applications in nearly every specialty  including orthopaedic surgery. A range of clinical applications are undergoing extensive research and development. 3D printing utilizes a unique manufacturing process from concept to real-world design. Thr an additive manufacturing process, a product is engineered de-novo using a wide array of materials. Traditionally, products have been fabricated using raw materials in a subtractive manner through machining processes, such as Computer Numerical Control (CNC) and Mill/Lathe machining. CNC manufacturing is advantageous in that its creations can be reliably produced with a high degree of tolerance. However, there are limitations to the subtractive manufacturing, including physical impediments in the design process. While there are effective solutions to this in the engineering world, often in medicine, biomaterials and complex anatomic designs are difficult to effectively replicate through subtractive manufacturing, especially on the micro scale. To fabricate a 3D-printed model, a concept must first be developed through drafting. Typically, computer-aided design (CAD) software is utilized to create a 3D geometric model. Next, the material(s) must be selected based on availability, workability, and cost. Several different types of 3D printers are available, and the application dictates which type of printer should be utilized. At present, Fused Deposition Modeling (FDM), stereolithography, and other additive manufacturing techniques are the major workhorses of 3D printing for medical applications. FDM is one of the earliest and the most basic 3D printing technologies, and it involves the melting of thermoplastics through a heated nozzle, quite analogous to glue gun technology. The nozzle deposits the material layer by layer, with no curing process required; the newly layered thermoplastic hardens and integrates itself into the previous material or scaffold. Other 3D printing processes may require a curing stage with an external energy source, such as UV light, lasers, or electron beams. Orthopaedic research laboratories currently utilize the FDM printing method for rapid prototyping and end-use product printing. It is well suited for applications in which plastic materials can be used, such as for fabricating parts for biomechanical testing or for creating custom saw guides. After a CAD design is imported and the desired materials are loaded, the 3D printer can output a product in less than a day. Some post-processing is usually required, such as removal of scaffolding or additional machining. Once finished, the 3D-printed product can be ready for immediate use, whether it is a prototype or an end-use product. 3D printers are capable of printing a wide array of materials, from cobalt chrome and titanium to different forms of plastics. Some recently developed printers are capable of printing biomaterials, such as live bone tissue and soft-tissue scaffolds, thus broadening the applicability of 3D printing. As modern 3D printers become more compatible with materials relevant to orthopaedics, the integration of this technology into the field of orthopaedic surgery will only grow. There are numerous examples of how orthopaedic surgery currently employs 3D printing technology. Some of the first orthopaedic innovations were large-scale designs that were still highly patient specific and fully customizable, such as fracture-specific casts and custom-fitted prosthetics. The concept of a fracture-specific cast is based on creating a predetermined mold that offers optimum stabilization for a case-specific fracture pattern. Customized 3D-printed prosthetics have been popularized for practical and creative reasons. Amputee patients, for example, can receive affordable, personalized prosthetics in which the designer can add a limitless amount of creativity – such as a fully functional and sleek “Iron Man” arm for a child. Previously, a prosthetic of this nature would have been significantly expensive and challenging to manufacture. 3D printing allows for unique and affordable solutions. Figure 1. A patient-specific cutting guide was fabricated to fit the exact contours of the tibia. This “true-fit” principle ensures accurate guide placement and saw cuts. Figure 2. A 3D model was created using computer software (above), which then communicates with a 3D printer to fabricate the product. An example of an anatomical model is brought to life using 3D printing technology (below). 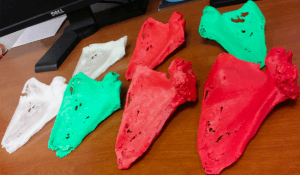 These teaching models can replicate bony anatomy to mimic actual anatomic variants, including fabrication of cortices and trabeculae, and they have material properties and a feel that is similar to live bone. 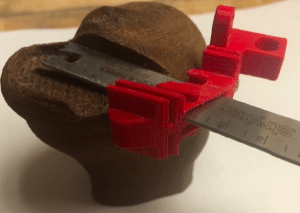 In many ways, 3D printing of anatomic models offers vast improvements over sawbones and other models traditionally used in resident education. In addition, the fabrication of proper testing structures and instruments is integral to the success of a biomechanical study, and 3D printing makes the production, availability, and customizability of these components feasible. Whether it is creating a construct for testing or designing modular tray inserts to simulate alignment, 3D printing technology offers unique solutions to the procedural details and methodology of an experiment. Such applications with closer-to-life accuracy enhance the quality and repeatability of orthopaedic biomechanics and biomaterials research and help bridge the translation of laboratory to clinical practice. Although the field of orthopaedic surgery has just begun to benefit from the many capabilities offered by 3D printing technology, it is interesting to imagine what the next stages of development will bring. For example, highly customized implants, including fracture-specific plates, are currently in their early stages of development, [10,11] and in tandem with computer modeling and templating systems, can be fabricated in a reliable and cost-effective manner. A plate can be manufactured to fit the bony contours to provide maximum fixation of a reduced fracture. Moreover, the screw holes can be customized to minimize the working distance across the fracture site on a fracture pattern-specific basis. A construct of highly customized design may have the strongest benefit in complex fracture patterns, as standardized plating may not provide adequate fixation options or possess adequate contours, which may compromise fit. There is great interest in patient-specific joint reconstruction due to the advantages and evolved capabilities of modern 3D printing. Using the patient’s radiographic studies, a customized prosthesis – complete with fitted cutting guides – can be fabricated (Figure 3). Figure 3. Using a patient’s prior CT studies, a scapula was modeled for preoperative planning, surgical decision-making, and operative simulation. Multiple iterations of a model were easily produced. Long-term clinical outcomes of patient-specific instrumentation/implants have yet to be established. However, recent studies suggest that patient-specific instrumentation/implants, in their current state of development, can be equivalent to outcomes of conventional implants and instrumentation [12,13]. 3D printing can potentially benefit complex revision TJA cases as well: Highly customized augments and reconstructive acetabular cages could be fabricated for patients with extreme osteolysis and bone loss. The custom implants could be preoperatively fabricated to provide an “exact” fit to fill the defect. In addition, an osteo-inductive material could be integrated within a porous construct to accept and structuralize bone grafts and further stimulate and promote union. As technology and applications continue to evolve, 3D printers can be adapted to construct end-use products with live biologic tissue. For example, the ligament-bone and musculo-tendinous junctions represent particularly difficult structures to successfully repair. Further, soft tissue applications, such as meniscal transplantation, have structural and intraoperative fixation challenges that currently lack viable solutions. These ongoing challenges could potentially be addressed through additive manufacturing and enhanced scaffolding interfaces offered by 3D printing. [15-17] It is envisioned that a bone-tendon-bone soft tissue scaffold can be manufactured through 3D bioprinting using material grown from a patient’s host tissue. Further, with reverse MRI technology combined with advanced scaffolding interfaces, a true-to-size osteochondral plug could be fabricated and implanted into a host joint. In today’s cost-conscious healthcare environment, 3D printing can deliver customized solutions in a time-efficient, reliable, and cost-effective manner. There are, of course, considerable start-up costs for 3D printing technology, including overhead and dedicated staff. However, ongoing maintenance and operation, along with the materials required to fabricate products, can be affordable and the benefits of 3D printing can be realized without creating significant economic burden. Institutions with academic, teaching, and research interests may gain the most from 3D printing. In addition, resident training programs can experience a benefit from the capabilities of 3D printing, including the ability to provide real-world surgery simulation and anatomic models to trainees and faculty that were once costly and difficult to obtain. In the future, once it has gained a more solid foundation and further integration in medical practice, 3D printing has the potential to successfully address clinical problems to a highly patient-specific degree while offering a unique, personalized approach that solves many issues specific to orthopaedic practice. Investment in this technology may improve clinical outcomes, ease the burden of technically challenging cases, and even increase patient satisfaction, all the while being time and cost effective. Although 3D printing capabilities have been available for many years, the evolution of modern technology and the increased amount of information on the process has propelled 3D printing technology into a more prominent role in medical fabrication and applications. For the hobbyist, several websites provide instruction on manufacturing anything from furniture to guns and ammunition. A person can easily access these open source websites, find and download a design of his or her choice, and within a few hours, have a 3D-printed product ready for use. With the proper materials, individuals may even be able to manufacture their own pharmaceuticals and medical devices. Use of 3D printing technology should also be introduced to medical treatment with caution, as no high-level evidence has shown the effectiveness of any existing 3D-printed medical applications. Although current applications are limited and may seem promising at this time, the full implementation of these devices needs to be supported with research and used with scrutiny. More research is needed to support the utilization of 3D printing in orthopaedic practice to demonstrate safety and efficacy. 3D printing technology has revolutionized design engineering in orthopaedic surgery. An institution’s investment in this technology can improve its surgeons’ ability to preoperatively plan complex cases, develop implant designs, and enhance trainee education. With technology evolving in every aspect of medicine, 3D printing continues to improve and diversify as it integrates into the field of orthopaedic surgery. Challenging clinical and academic problems can be addressed with low-cost and efficient production, offering a new perspective on solutions to these issues. Jonathan M. Vigdorchik, MD, is an Assistant Professor of Orthopaedic Surgery and Associate Fellowship Director in Adult Reconstruction at NYU Langone Medical Center’s Hospital for Joint Diseases, New York, New York. Stephen Yu, MD, is an adult reconstruction fellow at NYU Langone Medical Center’s Hospital for Joint Diseases, New York, New York. Michalski MH, Ross JS. The shape of things to come: 3D printing in medicine. JAMA. 2014 Dec 3;312(21):2213-4. Limbitless Solutions: Stories. Available at: http://limbitless-solutions.org/index.php/category/stories/. Accessed August 22, 2015. Bizzotto N, Sandri A, Regis D, Romani D, Tami I, Magnan B. Three-Dimensional Printing of Bone Fractures: A New Tangible Realistic Way for Preoperative Planning and Education. Surg Innov. 2015 Feb 2. Huang HJ, Zhang GD, Ouyang HB, Yang Y, Wu ZL, Xu J, Xie PS, Huang WH. [Internal fixation surgery planning for complex tibial plateau fracture based on digital design and 3D printing]. Nan Fang Yi Ke Da Xue Xue Bao. 2015 Feb;35(2):218-22. Tam MD, Laycock SD, Bell D, Chojnowski A. 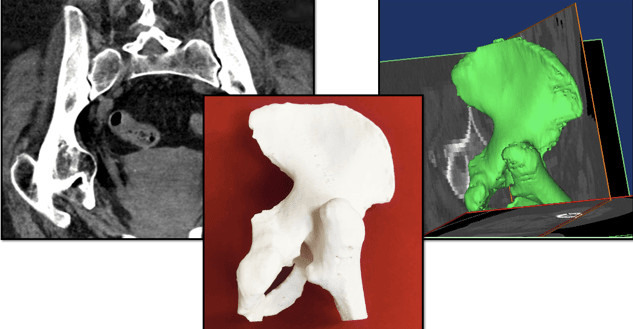 3-D printout of a DICOM file to aid surgical planning in a 6 year old patient with a large scapular osteochondroma complicating congenital diaphyseal aclasia. J Radiol Case Rep. 2012;6:31-37. Starosolski ZA, Kan JH, Rosenfeld SD, Krishnamurthy R, Annapragada A. Application of 3-D printing (rapid prototyping) for creating physical models of pediatric orthopedic disorders. Pediatr Radiol. 2014;44:216-221. Kurenov SN, Ionita C, Sammons D, Demmy TL. Three-dimensional printing to facilitate anatomic study, device development, simulation, and planning in thoracic surgery. J Thorac Cardiovasc Surg. 2015 Jan 8. Wu XB, Wang JQ1, Zhao CP, Sun X, Shi Y, Zhang ZA, Li YN, Wang MY. Printed Three-dimensional Anatomic Templates for Virtual Preoperative Planning Before Reconstruction of Old Pelvic Injuries: Initial Results. Chin Med J (Engl). 2015 Feb 20;128(4):477-82. Yang M, Li C, Li Y, Zhao Y, Wei X, Zhang G, Fan J, Ni H, Chen Z, Bai Y, Li M. Application of 3D Rapid Prototyping Technology in Posterior Corrective Surgery for Lenke 1 Adolescent Idiopathic Scoliosis Patients. Medicine (Baltimore). 2015 Feb;94(8):e582. Nam D, Park A, Stambough JB, Johnson SR, Nunley RM, Barrack RL. The Mark Coventry Award: Custom Cutting Guides Do Not Improve Total Knee Arthroplasty Clinical Outcomes at 2 Years Followup. Clin Orthop Relat Res. 2015 Feb 25. Oryan A, Alidadi S, Moshiri A, Maffulli N. Bone regenerative medicine: classic options, novel strategies, and future directions. J Orthop Surg Res. 2014 Mar 17;9(1):18. doi: 10.1186/1749-799X-9-18. Hollister SJ, Flanagan CL, Zopf DA, Morrison RJ, Nasser H, Patel JJ, Ebramzadeh E, Sangiorgio SN, Wheeler MB, Green GE. Design Control for Clinical Translation of 3D Printed Modular Scaffolds. Ann Biomed Eng. 2015 Feb 10. The NIH 3D Print Exchange. U.S. Department of Health and Human Services — National Institutes of Health. Available at: http://3dprint.nih.gov/. Accessed August 22, 2015.